Lesson number one in the Solar-UMPC project is that the weather is chaos and if you live in mid-northern Europe, you can’t rely on it as a source of instant energy. You’ll see how I’ve had to adapt my solution in my first Solar UMPC video. In the video I present the solar charging and storage setup that I’ve decided to use for the tour. Its based on the fag-packet drawing I did a few weeks ago after deciding that Li-Ion batteries weren’t really the best solution. I’ve introduced the lead-acid battery as a buffer and despite the 100-year old technology and 2.6KG weight, provides the perfect stabiliser to the whole architecture. Sunlinq 12v / 25W foldable solar panel. Sonnenschein 12v / 6.6Ah lead-acid battery. TabletKiosk MP3400 Li-Ion battery pack. Voltcraft dual-mode 12v battery charger. More pictures in the gallery here. Many thanks to SelectSolar for their help in preparing this solution. your email link is not working. Could you have a look at it please. I don’t have an email link on this page as far as I know. You can use this form if you need to contact me. maybe not enough voltage but I believe this product corresponds to the integation of different compnents you mentionned, isn’it? I guess I could combine a number of those together but it would be a bit of a nightmare mounting them somewhere! great video. Can you tell me why we need the lead acid battery? I’m not really thinking of charging anything other than batteries and pocket pc, mostly 5V devices. Althought it would be lovely to charge my 19V notebook. do I still need the lead acid battery? the example Ramzid sent has a maximum output of 9V so we’d still need additional power if we wanted to charge notebook pc’s would we? I’ll try to explain why the L-A battery is needed. 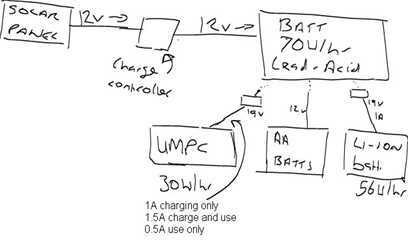 Li-Ion batteries (in notebooks) charge using a constant current (stream) of power at a fixed voltage. Usually this is around 1A. Most of the 12V portabl solar panels only reach this power at high sun levels meaning you can only use them for a few hours mid-day. In fact a 12W panel such as you have might not even be enough. Secondly, if you have a huge panel that could deliver, say, twice as much power as needed, its not used. Only the power needed is taken. The rest is wasted. L-A batteries are more flexible. YOu can charge them with a little trickle and also with a higher charge rate. They are much more suited to pairing with a solar panel. To power the laptop and charge it at the same time you’ll need even more power. Your 12W panel will not be able to do that. The answer is to charge as much as you can into the L-A battery and then release it as-needed into your laptop via a voltage converter. The problem with this solution is weight. Small 12v L-A batteries are over 2KG in weight! Whats needed is a flexible Li-Ion battert charing solution. Currently there are no products on the market that can achive this. 1 – Get a panel powerful enough to charge a li-ion battery at 70% of its rated output. For example, a 25W panel and the Tekkeon MP3400 li-ion battery. This will give you about 4 hours of charge time on a sunny summer day. Enough to completely fill up the li-ion battery. thanks for this remarkable video, it was a great source of information for me and saved me a lot of time for searching for suitable products.